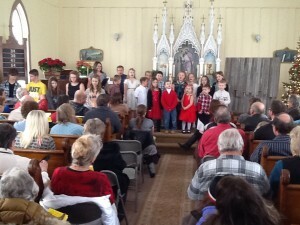 The original Rindal Church, located in rural Viking, Minnesota, closed its doors with their last formal service in 1975. They established a Cemetery Board to maintain the church, its grounds, and the cemetery. It had become a serene landmark to the area residents, bringing warm memories of days past. But this is just where our story begins. On March 13, 2011 a group of individuals began meeting in homes, with dreams of forming a new Lutheran church. It didn’t take long before we began to outgrow the homes we were meeting in, and we received an invitation to utilize the old country church. We quickly began the clean-up and renovation efforts needed to bring life back to this old country church. From the beginning we were blessed with the ministerial guidance and services from area Pastor Ollie Urdahl. And by mid-2011 we had established our Sunday School and Sunday Worship Services. In October 2011 we approved our affiliation with the NALC with 65 charter members. We have continued to grow in numbers, strength and faith. But one thing is certain, Rindal Lutheran Church is resurrected! We have an average of 46 people for worship each Sunday, and have a very active Sunday School program with over 20 kids. We may soon outgrow the current building, but we trust the Lord will lead us as He has in the past. We’d like to extend a warm welcome to our NALC brothers and sisters. If you find yourself in our area, please worship with us, and find out for yourself the life and breath that God has given to the Old Country Rindal Church! Our congregation worships at 23511 110th Ave NW, Newfolden, MN. Please join us!